The LSSWG had been discussing landing options for more than four years, pulling in comments from the wider community. But this week's meeting came down to a straight fight between Oxia and a place just to the north called Mawrth Vallis. Both "finalists" hold promise for finding the traces of long-ago microbial activity. However, after hearing all the submissions - the working group has decided Oxia represents the best combination of compelling science and engineering caution. Oxia lies about 18 degrees north of the equator, ensuring ExoMars' solar panels will get good exposure to sunlight all year round. But it is the potential of what could lie under the rover's six wheels that most excites researchers. Observations from orbit suggest the surface materials at this location contain abundant clays - the type of sediments that will result from rock-weathering processes involving water. Researchers see evidence for lakes at Oxia, too - and rivers and deltas. And with ExoMars' specific life-detecting technologies, it might just be possible to find the traces of biological activity in the sediments. Prof John Bridges from Leicester University is a member of the working group. He commented: "With an enormous catchment area the sediments will have captured organics from a wide variety of environments over a long period of time, including areas where life may have existed. The fine sediments should also be ideal for the ExoMars drill - it aims to get to 2m depth." One key advantage Oxia Planum had over Mawrth Vallis in the selection process was elevation. This is considerably lower at the former - by about 1,000m. This extra altitude affords more time for a parachute to bite the atmosphere and slow the approach to the ground. 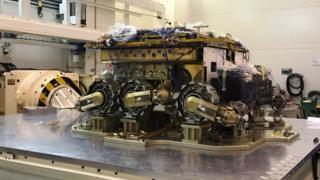 The European-led rover is being assembled by Airbus at its UK manufacturing centre in Stevenage.